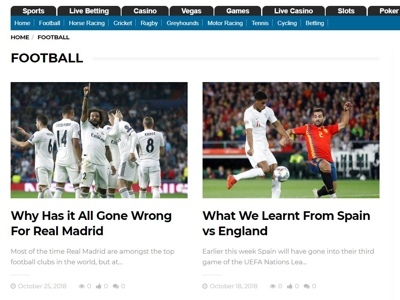 Winner Sportsbook hasn’t been around all that long, but after doing their homework and monitoring what the competition was up to, they launched a product that embodies everything the big brands offer but in a less flashy package. Great for punters who bet on sports from the USA as well as covering the major UK markets, Winner use a combination of promotions and loyalty bonuses to enhance otherwise average odds and make themselves a destination for many bettors in the UK. It’s hard to pin them down in terms of personality, they aren’t a brand that goes for gimmicks or tries to sell themselves on character. Winner are the guys who get their heads down and focus on the job in hand, providing a site that may be no frills, but is certainly no problem to use. While Winner don’t quite match up to the big boys with the number of Sports they offer markets on – which sits respectably around the mid-twenties – the Sports they do cover are well looked after. Football games in the UK top tier leagues can surpass 200 markets, for example, while even Solihull vs Halifax has 93+. Fans of American sports will be especially happy to bet here, as not only are these events covered in detail, but the prices tend to be excellent – you can even use American odds if you prefer. The Football odds are often competitive too. On the flip side, odds are not so great on Live markets. This is obviously Sport dependent but if you are looking for small margins on in-play bets you might be better off looking somewhere else. Football, Ice Hockey, Basketball and Tennis probably hold the greatest depth of markets; but the Entertainment markets are a little more interesting than usual, while MMA, Volleyball, and the increasingly popular E-Sports are also available. The Calendar feature helps you plot your next move, and the stats on hand are useful for making your mind up on which bet to take. These aren’t extensive but, where available, will be detailed enough for the average punter. There are also frequent promotions, daily enhanced odds (especially on the Horses) and a decent loyalty program to sweeten the deal. Let’s start by saying that if you enjoy Live Streaming then there isn’t much for you here, unless of course you bet on Horse Racing, which is the only Sport you can watch live at Winner. You will need to have placed a £1 bet to access it but that seems fair to us. 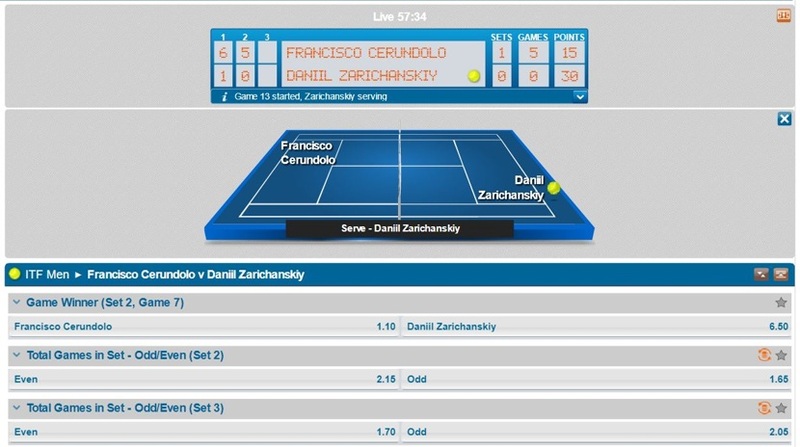 The selection of In-Play markets available is impressive, and the interface can be customised in Regular, Overview and Multiview to allow you to focus on and track more than one event at once. You can jump between these options too without losing your selections, making for a live betting experience that really puts you in the driving seat. The graphic display is average and the level of statistical data basic, but the functionality of the whole In-Play area works brilliantly. Most importantly, the range and depth of markets leaves plenty of scope for bettors to explore every facet of each game or match, meaning that every kick, serve or throw could turn into a winning opportunity. On the surface everything seems to be in order here, apart from the Cashier opening a separate window when you want to use it, of course. For some reason the minimum deposit might vary between the mobile platform and the desktop platform, but on the whole minimums and maximums are perfectly manageable. There are no fees and plenty of payment methods to choose from, including Boku and everyone’s favourite, Paypal. As for withdrawal time frames, it’s not such great news we’re afraid. This is actually a pretty nifty little area of the site. Updated every week and easy to search through to search out articles that are of interest to you, this is a handy area to peruse during half time, for example, and to see what else is going on the sporting world. You might even read something that lights the spark for your next winning bet. The articles themselves are well written and clearly authored by those in the know, providing quality content that is worth reading. With a focus on US markets, Winner offer regular sweetners to their ACCA customers. These have included giving punters a free bet if one of their selections lets them down on a 5 fold+ where all of your other selections come in. This would soften the blow somewhat, no doubt. Tennis is another area that often gets similar treatment. 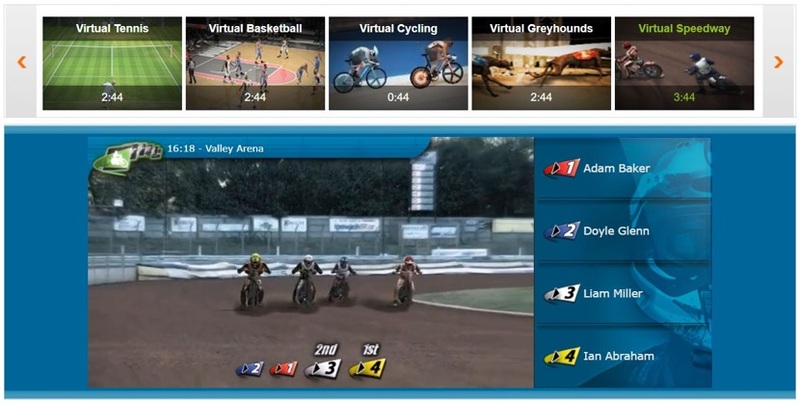 Football, Tennis, Basketball, Horse Racing, Speedway, Cycling and Greyhounds make up the virtual sports offering. Graphically, Winner are embracing the computer game style rather than trying to make it look like real life, which works in their favour, and some of the commentary is fun too – especially in Basketball. We also like that they have made up stats for each game before it starts, such as Form, Rating, Last 5 Games etc, sport dependent. There are a decent set of markets too for some of the team sports, but events do tend to take 4 or 5 minutes to renew, which is long enough to get bored of waiting. You can use the cash out feature to either take a smaller profit on an event in which your selection is doing well but you think things will change, or to minimise the loss if your selection is not doing well and you don’t see them improving. If your bet is available for cash out (not all are) you will see the amount being offered on the orange button below your bet. This will change regularly when the event is in-play to reflect the current situation, so if you see a price and you like it, take it quickly. 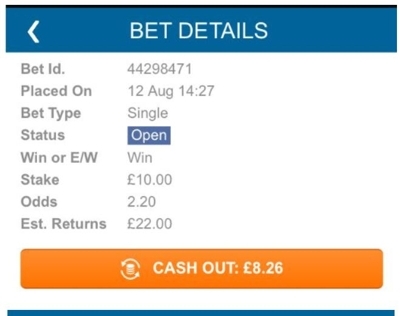 The Cash Out option can be found within the Betslip. The Casino was Winner’s initial product, so it’s been around a little while longer and has amassed quite a haul of slots, table games and video poker games to name just a few. A Live Casino is also on show if you prefer to see who is dealing your hand and enjoy a more communal betting atmosphere, as well as Jackpots and a downloadable Poker product. Playtech feature heavily as a software provider, which makes sense since the site is built on their platform, and there are quite a few promotions you can take advantage of too. The site has a lot packed into it which can often be a problem with regards to presentation, but luckily Winner has everything organised efficiently so that finding your way around shouldn’t cause any issues. Visually, however, we couldn’t help thinking about AOL – sorry Winner! The homepage sensibly lays out Live and Upcoming events in the first instance, as well as bets that are proving popular; but if you are after something else you will be able to find it in seconds using either the search bar, Quick Links, Favourites tab, or the A-Z of sports. What’s more, stats relative to your selection – if available – tend to be showcased in an interesting way that isn’t visually baffling; although they will open another window. This is one issue we have with the site, actually, a lot of options open a new window (Cashier, Live Chat) so it can be hard to keep track of what’s what. Loading and reaction times are also a little sluggish, the Support tab (instant support) comes and goes, plus, one or two the buttons/links don’t seem to work. This is odd when you realise that the Sportsbook platform is provided by Playtech BGT Sports (PBS). Playtech have a reputation for excellence in the online gambling industry, and work with some of the biggest brands in the market – they are also expensive. Maybe Winner just need to roll their sleeves up and give the site a bit of a workout, because these few minor niggles aside, they have a website that delivers on multiple fronts. It has depth, multiple features, and is no trouble to traverse in terms of navigation. An online bookie can’t expect to be taken seriously these days if they don’t also offer mobile betting capabilities. Winner’s mobile site mimics the desktop version to a point, but we found it outperformed its older counterpart when it came to loading times. The design looks good and works well, it’s one of the simplest we have seen without feeling like it is lacking anything, though while cash out is available it isn’t the instant one tap option we have seen elsewhere. Access to pretty much everything is via the Menu button, although there are Cashier, Betslip and a scrolling list of Sports made instantly available, and it’s a smooth and stable ride when you use them. 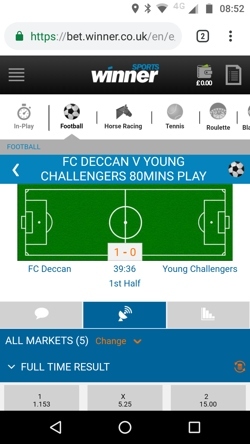 Live betting and Live Chat are both still there, the search bar too which can be utilised to search for a team or player, and you lose nothing in terms of range and depth of markets. We did miss the ability to access stats on the mobile site (if it’s there we didn’t find it) but on the plus side Winner do have mobile only offers and promotions. This, then, is largely positive news, so if betting on the move is your bag you could do a lot worse than Winner. Launched as a gaming site in 2009, Winner are owned and operated by PT Entertainment Services Ltd, who are based on the Isle of Man. They sum up their ‘mission’ in two words – creating winners – although we figure that making money factors into that ethos somewhere, as well. Initially known as a Casino, Bingo and Poker destination, the Sportsbook side of the business wasn’t let loose until 2013, yet in a relatively short space of time they managed to gain good traction in the industry. They launched with a TV advertising campaign that was a little underwhelming, and in 2016 they became the official partner of the mighty Durham County Cricket Club, creating unique markets specifically for them. Granted, they haven’t been as busy or as noisy as some of their contemporaries, but Winner have quietly been going about their business and growing steadily. A good choice for those of you who prefer betting on a device rather than on your laptop. You will have access to a vast range of Sporting events, most boasting plentiful and interesting markets. If there was such a thing as an intermediate bettor then this would be the perfect place to go for them. There is just enough detail to satisfy the needs of those who treat betting as more than just a bit of fun, but not so much that all the joy is sucked out of the experience for those punters who don’t take it so seriously. If you are impressed by the latest gadgets and branded merchandise you might find the site a little dated and tired, but if you are more interested in finding the most lucrative odds then Winner is often up there with the best. Winner are really trying here. They offer around the clock contact in one form or another but the onsite support needs to be picked up, turned upside down, and given a good shake. The FAQ, for example, is full of errors and inconsistencies compared to the T’s and C’s. Hitting Help or FAQ will open a new window and give you a route to Live Chat, and this is available 24/7. Live Chat itself creates yet another pop-up window, although thankfully there is a notification sound so you know when you need to check back for a response. 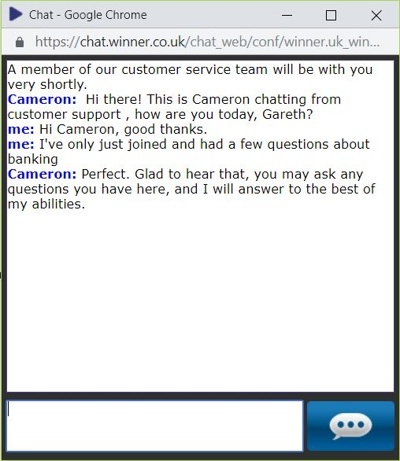 The team are always friendly and happy to help, they are even patient when you are having trouble closing the chat like we did. There is e-mail and phone support for most of the day, but not much of an online presence when it comes to social media. The FAQ feels half finished, and there is no way to prioritise or search it, so you just have to scroll through the whole thing and hope your issue shows up. It does, however, boast a section explaining the rules when betting on each individual sport which could be helpful if you want to try something new. Live Chat – A 24/7 service that begins with the Help or FAQ link on the homepage. Then look for the blue speech bubble icon. Phone – Either 0800 066 2410 or 0808 1203 498 will get you through to someone between 6am (why are you awake?) and midnight.